Being techies, we are someone who are never satisfied with their gadgets as we prefer updating them on the go with the trend. We had purchased an Apple iPhone 7 no more than a year ago but as soon as the news of iPhone 7 struck our ears, we came to the immediate decision of selling our current iPhone in order to buy its next installment. Frankly speaking, we never really imagined that selling a reputed gadget like iPhone, which was in very good condition as it still had 3 months of warranty left would prove so troublesome. From demanding our gadget at price as cheaper as a second-hand android phone to offering us a variety of deals which didn't even made any sense, we encountered with varied experiences on our way towards cracking a worthy deal for our precious Apple iPhone 7. The first thing which came to our mind was visiting the nearest mobile stores in our locality and getting a fair deal by exchanging our iPhone variant with the latest one. But after strolling through 4-5 different mobile stores including the one from which we bought our iPhone 7, there wasn't much to differentiate between the deals they offered. They were expecting us to pay more than half of the price of the new iPhone even after exchanging our current iPhone 7, so we ditched this option right away. The news of we selling our iPhone broke like a fire among our friends and we don't even know how and through the process, we received a call from one of our friend as he was interested in updating his iPhone 6s, which he was currently using. As he was well-aware of the way we had used our iPhone, we definitely expected a decent deal (if not the best of the lot) from him. But to our surprise, he started his emotional drama and was demanding it at a price which we couldn't resist laughing at eventually! Social networking sites are a great source of finding the targeted audience they say, but what we experienced was nothing less than a brain-fade. We posted the detailed information of our product, expecting it to reach the potential buyers, but all we got in return was funny memes and jokes (which weren't even funny) in our comments section. After a couple of bad experiences offline, we decided to take our hunt on online portals. We decided to list our iPhone on various ad portals. Many buyers did reach out to us, but none of them were ready to give us a fair amount of deal and the fact that our gadget didn't even possessed a single scratch and had about 3 months of warranty left, compromising and selling it at a cheap price was something our mind wasn't agreeing to. This process of finding a worthy deal for our precious product were getting on our nerves and we were slowly and steadily starting to our lose our hopes. But as they say, miracles are bound to happen when you least expect them to happen! 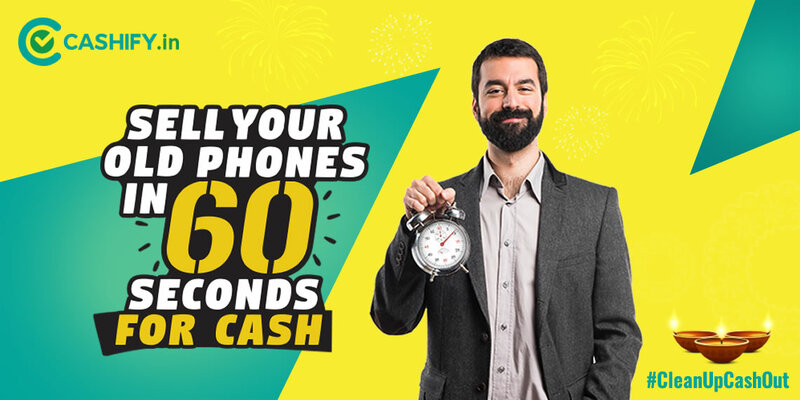 After researching a lot through the sea of online content, we came across Cashify which promised to sell old phone in 60 seconds for cash. Though our bad experiences werenil't letting us believe in this promise, but after checking out their website, we decided to give it a try and who knew, we were on a right path! INSTANT QUOTE - We were offered the best selling price, based on the present condition of our gadget and the current market price as soon as we selected our variant in the search box. FREE PICKUP - Cashify was kind enough to schedule a free pick up on our acceptance over the price offered for our device. CASH PAYMENT - We were given a choice of either accepting the payment through cash or any other desired mode, right away at the time of pickup. We were delighted and shocked at the same time after such a lightening fast selling experience. We never really thought that we would be able to sell our iPhone at the best possible price such quickly, considering the experiences we had initially. Also, what adds to the awesomeness of this platform is that you can avail extra stuff by using various promo codes as per your deals. Use Coupon Code: CLEANCASH and #CleanUpCashOut with CASHIFY.in to get an additional Rs. 250/- on the sale of your gadgets. You can also download the Cashify App for free, available at the Google Play Store and Apple Store to sell your gadgets faster!